A project to restore a historic canal has received a £3,000 donation. The Shrewsbury District & North Wales Branch of The Inland Waterways Association has donated the money towards the ongoing restoration of Wappenshall Wharf in Telford. The restoration work is being carried out by Shrewsbury and Newport Canals Trust (SNCT) which is hoping to be able to open the smaller wharf building as a coffee shop in the autumn. Both buildings are grade II listed and date back to 1835 and 1838, when Wappenshall Junction became an important and busy interchange between the Shrewsbury Canal and the Newport Branch of the Birmingham & Liverpool Junction Canal, now known as a part of the Shropshire Union. Since the closure of the Shrewsbury and Newport canals, the site has been used as a coal yard and by a truck repair business before it was taken over by SNCT which applied for planning permission to restore the site in 2008. 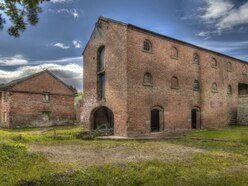 It is now owned by Telford and Wrekin Council and leased to SNCT on a 125-year lease to maintain and restore the buildings. The donation of £3000 by the local IWA branch enabled the trust to buy a much-needed scaffolding tower to help with the restoration work.